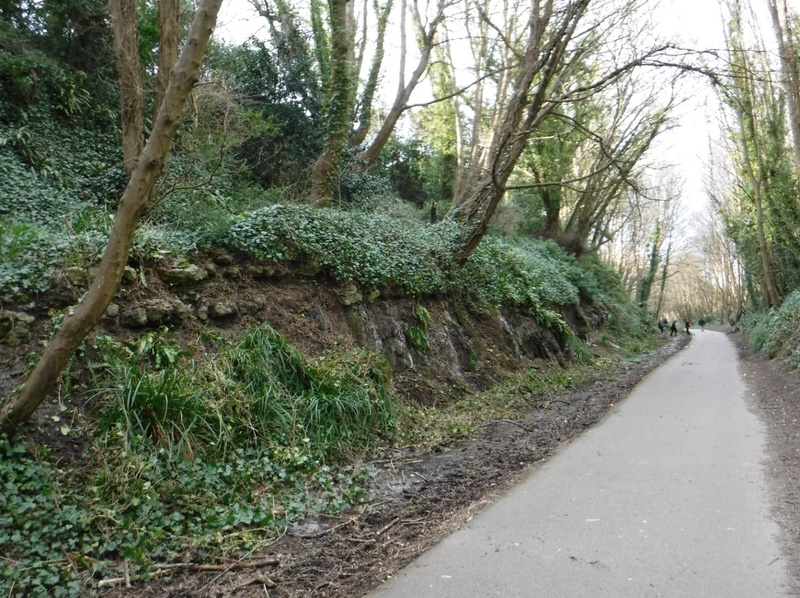 Regular users of the Rodwell Trail through the Rodwell Cutting will have noticed that rock along part of the western side slope has recently been re-exposed by the removal of overhanging ivy (Photo 1). 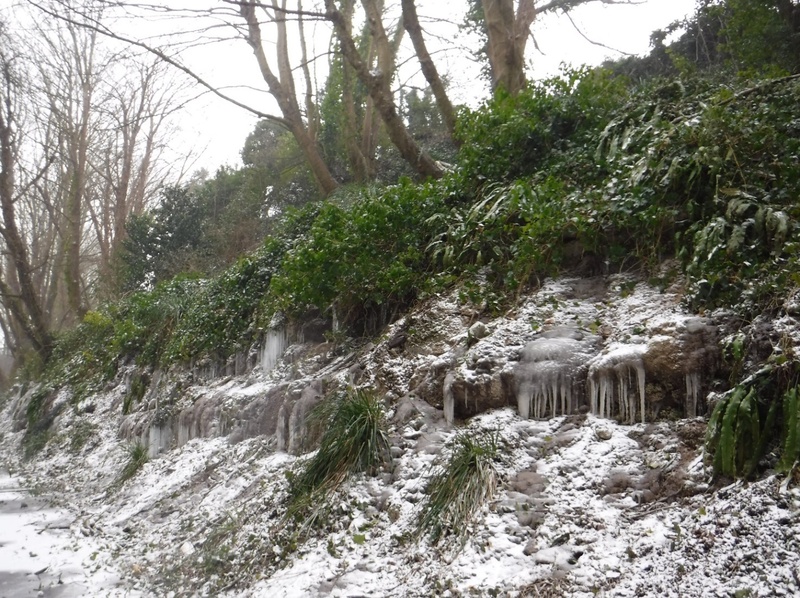 This work has been carried out by the Friends of Rodwell Trail, with the permission of the Borough Council, aiming to reveal the character of the Jurassic strata and to clear the springs issuing as a ‘dripping well’. The Friends also aim to come up with plans to improve drainage and to enhance the wildlife interest of the cutting. The rocks were laid down as limey, sandy and muddy sediments approximately 160 million years and are classified as belonging to the Osmington Oolite and Clavellata formations of the Corallian Group. They were described by eminent geologists in the 19th century but have been largely forgotten in recent times as they became progressively obscured by vegetation, now like a very big scratch card ready to reveal what’s underneath! The dip of the strata is clearly visible in some of the thinner bedded limestones. The cutting was excavated in 1863 at the highest point on the mainland section of the Weymouth-Portland railway. Most of the material removed was used to construct the embankment across the Marsh. As excavation proceeded downwards the water table within limestone and sandstone beds was intersected and springs issuing further east above Hope Cove ceased to flow. The local population had been provided with a piped water supply from the Sutton Poyntz works in 1856 but the springs and associated shallow wells were still used by the brewing industry. The present dripping well represents the remnant of this groundwater and forms a rather indistinct stream flowing north towards the Wyke Tunnel. The quality of the water is good enough to support watercress and other native wetland plants. In very wet seasons some of the water also flows south towards ditches beyond the Buxton Road Bridge. The ‘dripping well’ is a petrifying well; twigs, leaves and artifacts caught on the rock face become coated with tufa deposited as calcium carbonate-rich groundwater is exposed to the atmosphere. This is an active sedimentary process that could leave its mark on the geology of the future! During the recent ‘Beast from the East’ cold snap the tufa became coated with a layer of ice and long icicles formed from the drips of the well (Photo 2). 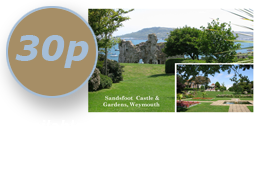 Together with the Western ledges on the shore of Portland Harbour 400m to the south-east, this site has the distinction of being in the centre of the Jurassic Coast. 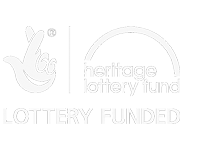 The exposed strata will shortly be assessed by the Dorset Important Geological Sites Group (DIGS) to determine whether the site is worthy of being recognised as an official DIGS site. The Friends of Rodwell Trail, in conjunction with the local authorities, will devise an environmental management plan for the entire cutting which will seek to improve drainage and biodiversity. The Friends will keep you updated as events unfold so that you can give your opinion on future plans and see how you can be actively involved in making those plans a reality.